There is concern among some Eurozone banks that the ECB may push the deposit rates on excess reserves into negative territory next year. 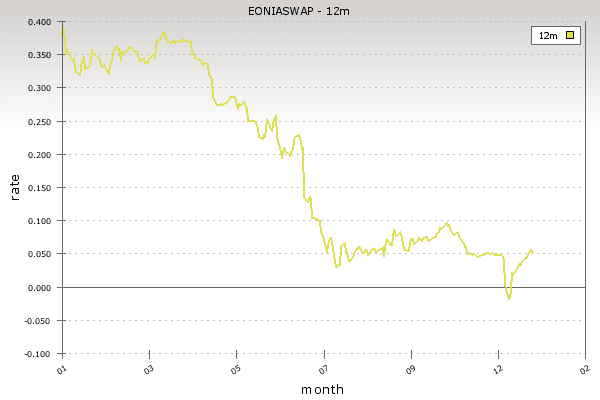 In fact the 12-month EUR OIS rate (the so-called EONIA swap rate), which is the market expectation of where the overnight rates will be next year, briefly dipped below zero recently. If that were to happen, banks would in effect be penalized for holding excess reserves at the ECB. Such action would force those who are able (more likely the core banks) to pay down their borrowings from the ECB (otherwise they are paying 1% for the LTRO funding and then paying again for depositing the cash at the ECB). JPMorgan: - There has been renewed speculation that the ECB will set a negative rate on its deposit facility. Indeed, the EONIA curve, which tracks the deposit facility, dipped into negative territory for the first time last week. Negative interest rates on deposits are like safe deposit charges – the idea is that they should incentivize banks to lend out money rather than suffer an erosion of capital. Core banks are more susceptible to negative deposit rates. The first response by core banks would be to repay back most of the extra funds they borrowed via the 3y LTROs, which they can do from January 30th. We previously argued that core banks could repay €100bn of 3y LTRO funds as yield compression makes carry trades less attractive. But an ECB deposit rate cut to -25bp could induce them to pay back perhaps all of the €140bn they borrowed on net via the 3y LTROs. In preparation for this potential event, banks have been paying down the shorter term LTRO balances (not all LTRO is 3 years). 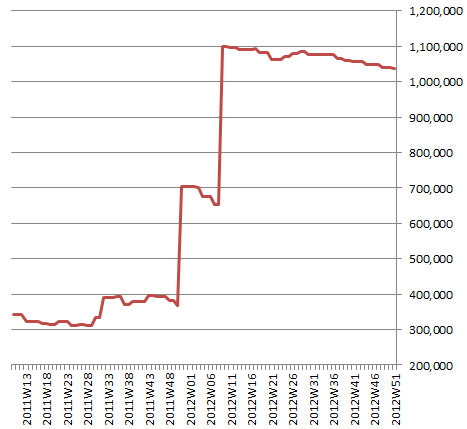 In fact the ECB is showing a gradual but consistent decline in LTRO funding provided to the euro area banks. According to JPMorgan, the effect of a negative deposit rate on excess balances would help the Eurozone periphery by pushing capital out of the core. JPMorgan: - ... an ECB rate cut to -25bp could accelerate that process [of paying down LTRO]. In trying to avoid negative carry, the resulting search for yield and increase in the velocity of reserves, i.e. passing on the “hot potato”, within the euro area banking system is likely to improve capital flows back to peripheral banks and reduce TARGET2 imbalances, especially now that the ECB has back-stopped the system with OMT. From this perspective, negative deposit rates could be a useful policy tool to induce financial re-integration in the Euro zone and ultimately allow the periphery to reduce its reliance on the ECB. Of course one of the reasons the Fed hasn't followed this path is a potential disruption to the money markets. Even the recent drop to zero rate on deposits by the ECB has caused havoc for euro denominated money market funds (see discussion). A negative rate would force money market firms to simply kick the existing depositors out, forcing them into periphery government paper or periphery banks - which of course is the idea behind negative rates.